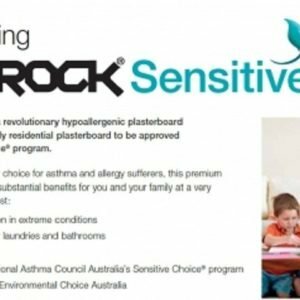 Gyprock Sensitive is part of Gyprock's special purpose range of plasterboards. This gypsum plasterboard's core is treated with a powerful but gentle antifungal agent, which penetrates through the paper liner and paint coating. The core contains a wax emulsion to make it highly resistant to moisture and humidity without compromising integrity and the product is classified as low in volatile organic compounds (VOC).